Pro baseball pitchers are lauded for their cannon arms, but when you can throw a ball at nearly triple-digit speeds, accidents can happen. 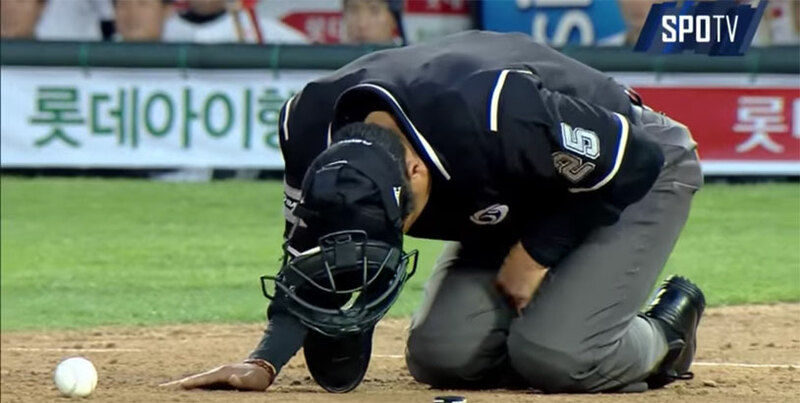 This clip from the Korean Baseball Organization shows just how painful those accidents can be. The pitcher shoots a ball straight down the plate, the batter’s swing catches the edge of it, it ricochets off of the fringe of the catcher’s mitt and right into the umpire’s crotch. He immediately crumples to the ground in severe groin pain and has to be stretchered out. This is a one in a million occurrence – sure, umpires have been beaned by stray pitches before, but the Rube Goldberg-esque path that ball had to take to land squarely in his gonads with that much force is ridiculous.